This faux newspaper from the upcoming, seemingly innocent stop-motion flick ParaNorman reveals some seriously spooky details. 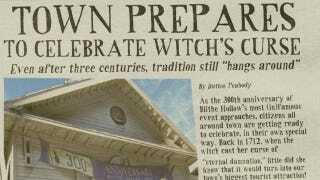 The film's city, Blithe Hollow, is celebrating the 300th anniversary of the town's most infamous event, a witch trial that sidled the entire town with an "eternal damnation" curse. How does Blithe Hollow celebrate? With hanging witch piñata parties! That certainly won't come back to haunt them. Empire has released a two-page look at the Blithe Bugle which paints the story of a poor man's Salem that's doing everything to exploit their dark history for tourists. The paper also reveals a few new characters, such as the teacher Mrs. Henscher and crazy old Mr. Penderghast who pens an interesting column warning townsfolk that "time is running out." Read the paper now! ParaNorman, a stop-motion movie about a young lad who can see dead people, will be in theaters August 17, 2012.